tarts & crafts: adopting a dog! Yup, we did it. We adopted a dog! Her name is Mocha and she's a really sweet, you'd like her. 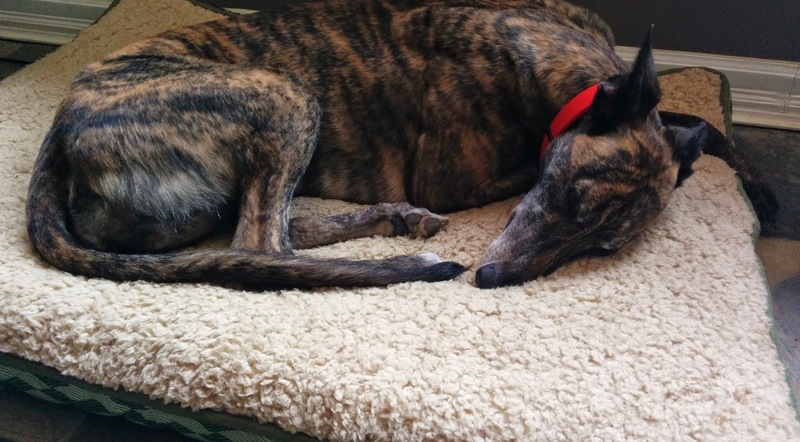 She's a retired racer. We looked into adopting a greyhound a few months ago and went to the GRA's annual picnic. There we got to walk a few dogs, and after walking Mocha, I thought "she seems really nice, I like her." After some deliberation we said let's do this and went back to get her a few weeks later. And she remembered us! Then we had to wait a month or so for all her shots and fixin's to happen and we finally brought her home two months ago. I have to say, thank goodness Mr. A has had dogs before, because I had no clue what was involved with having one until we got Mocha. I'm still getting used to picking up poop (I've only done it once so far), learning how to train her, and just plain old living with a dog. We're lucky because she was house trained and has a really calm personality so she walks well on a leash and doesn't bark or jump. You may find a few pictures of Mocha peppered into our blogs now. She says hello.